As theatre artists, we tell stories. We use language, movement, music, sound, lighting, fabric, puppets, clothing, structures, furniture, and more to build worlds that bring these stories to life. I’ve always been inspired by the way all of these elements combine. Part of the magic of theatre is in the collaboration between artists. That’s why we’ve selected this topic for our next series on the TYA/USA blog. 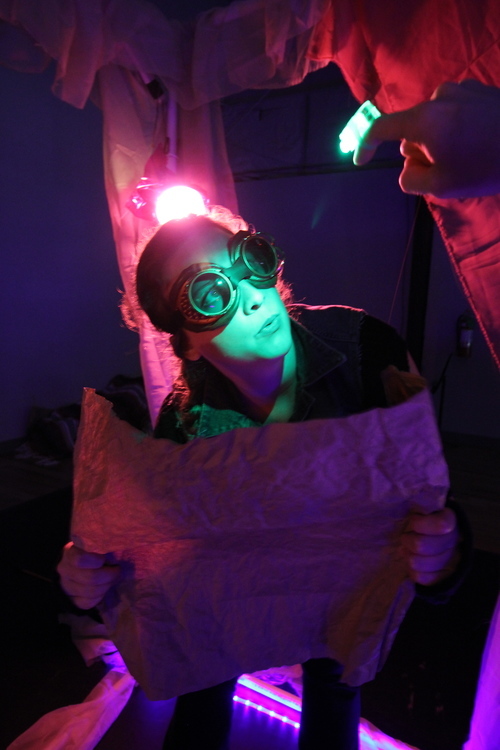 In Theatre for Young Audiences, we are often charged with creating fantastical worlds. Our playwrights and the imaginations of young people push our creativity, opening up exciting opportunities for artists to create stunning visuals. How are we collaborating with designers and visual artists? We’re also thinking about Theatre for the Very Young and Nontraditional TYA. In pieces with limited language, design becomes an important storyteller with visuals and aesthetics filling in where words are absent. What is the vocabulary of these productions? How do designers, directors, and performers collaborate to construct these vocabularies and worlds? And— how do we invite young people into this process? What does TYA look like? Does your theatre or work have a specific aesthetic? How is technology changing the aesthetics of our productions? What exciting and innovative ways are we working with designers and visual artists? What tips do you have for forging partnerships with designers? What excites designers about working in TYA? How are we or might we teach design to students? How are we or could we train emerging designers to work in TYA? If you are interested in contributing to the conversation we’d love to hear from you. We seek blog posts that are 500-1000 words in length that might explore one or more of the above questions. Please feel free to send other questions, ideas or blogs in reference to design and visual storytelling to beccadrew@utexas.edu. This post is the beginning of an ongoing series about Visual Storytelling and Design in Theatre for Young Audiences.